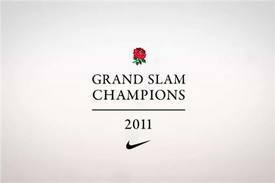 As Cathal Dervan reported in his blog here on Irish Central yesterday, Nike is hanging its swoosh in shame after jumping the gun—and the shark--by making a high-end TV commercial celebrating the English team’s anticipated Grand Slam win in rugby’s Six Nations Championship. On Planet Earth, however, Ireland would actually crush England 24-8 to deny them the coveted Grand Slam. The striking thirty-second clip would likely have been shown first on massive video displays at key London transit hubs the moment the final whistle blew in Dublin, with thousand of celebratory “Grand Slam Champions 2011” T-shirts ready for sale at those spots as well. To the chagrin of Rugby Union and Nike, the overreaching alternate-reality advert soon found its way into the social media jet stream.